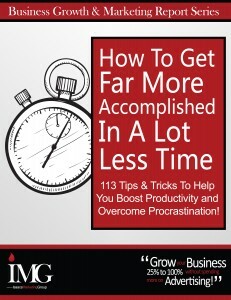 Tags: Accomplish more, Get More Done, IMG Reports, Time Management. 1. Accept the fact that there simply isn’t enough time to do everything. That’s why it’s so important to work on the most important things. If you’re always focused on the important things, both in your business and personal life, you’ll always be making the greatest contribution by using your time wisely. 2. Establish a relaxed state of mind. Keep calm. Stay focused on what you have to do. Ignore everything else. Too much additional stress can make the whole task that much more challenging. Your mental state is something you can control. Don’t let outside pressures get to you. Understand what must be done and do it in a calm, relaxed, self-assured manner. 3. Stop trying to be a perfectionist. It’s easy to get caught up in the trap of trying to make something just a little bit better. But often the results of the additional tinkering make little difference in the overall outcome, though the cost in both time and unnecessary stress can be sizable.